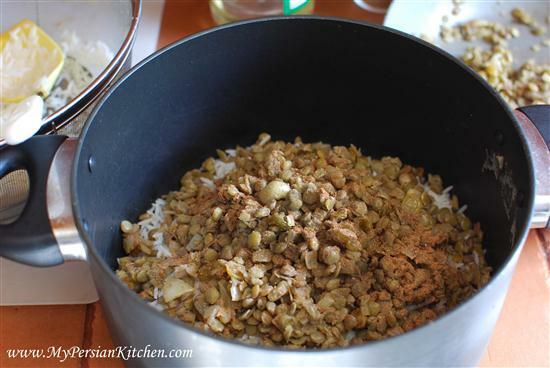 Adas Polow, a delicious rice layered with lentils, is one of my favorite polow. It didn’t necessarily used to be when I was younger, however, since I was a pesco-vegetarian for a couple of years, it was one of the polow that I could make when I craved Persian food or order at the restaurant. This is polow is definitely a winner when it comes to vegetarians and vegans! Not only is it delicious, but it is also very simple to make. Some people like to place the dates within the layers of rice. 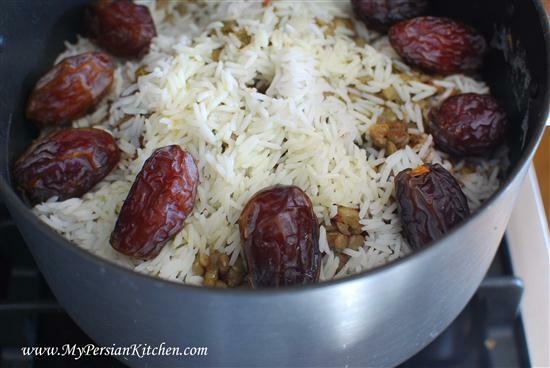 However, I like my mom’s method much better where she places the dates on top of the rice as it steams. Once the rice is ready she then arranges the dates around rice. Small dice onion and saute in oil until just golden. Add raisins and give it a stir. Season lightly with salt and add cinnamon. Mix well. 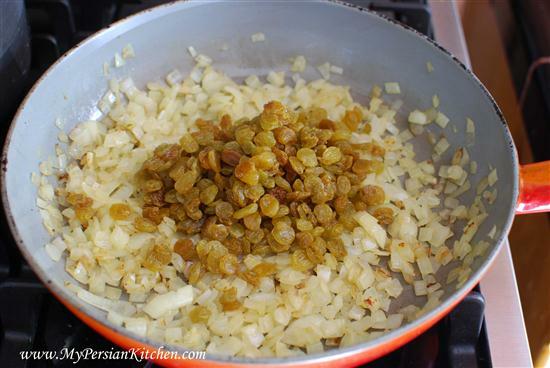 Once the lentils are ready add them to the onion and raisins. Mix well together. To a non-stick pot add 2 tbsp of canola oil, 2 tbsp of brewed saffron and just enough water to cover the bottom of the pot. Give the ingredients a stir and add a few spatulas of rice. Add 1/3 of lentil and raisins mixture and top with 1 to 2 teaspoons of advieh. Repeat layering rice and lentil/raisin mixture. Finish off with a layer of white rice. With the back of a spatula create a few holes in the rice. Arrange the dates on top of the rice. 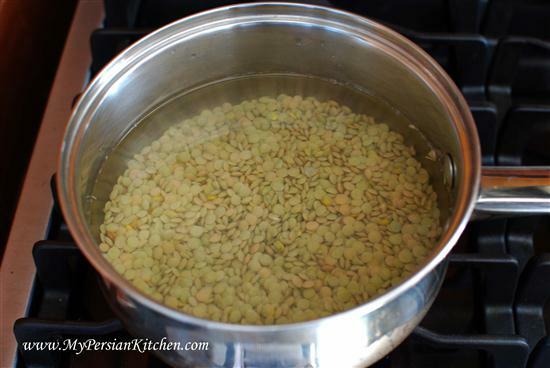 Mix together 2 tablespoons of canola oil, 2 tablespoons of brewed saffron and 1/4 cup of water. Pour the mixture over rice. Place the lid of the pot in a towel and place back on the pot and cook on low for 1 hour. And in the end you will have a delicious rice! You have no idea how happy I was to see ‘adas polow’ pop up in google reader!! 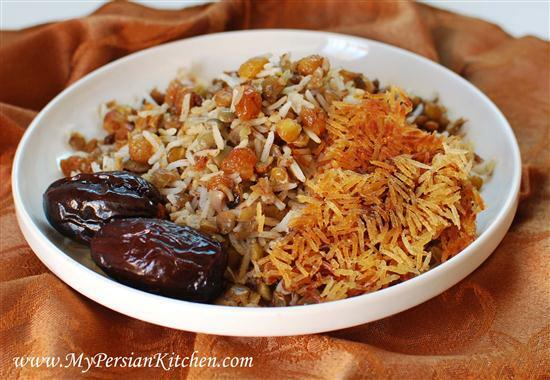 It’s my all time favorite Persian rice, and I haven’t yet managed to snag the recipe from my parents. Thank you!!! I love your blog. every recipe makes me want to take a day off and cook. Thank you so much! Janea, wooohooo!!! Now you have it and make it on your own!! Gaile, now that’s one of the most awesomest compliments ever!!! Thank you!! Looks amazing! Love Persian food. Just made this tonight. Thank you for the recipe! Cooked this last night for my boyfriend I hope he enjoys it since he won’t try it till tonight thx Recipe! 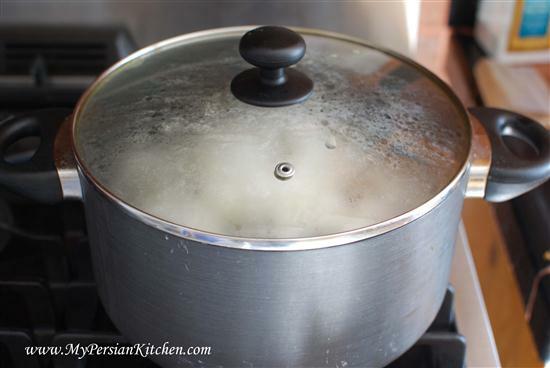 Sanam, can I make this recipe in a Persian rice cooker with success? I’m LOVIN’ my new rice cooker. 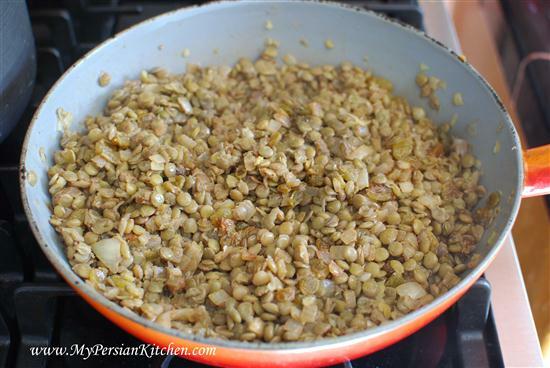 My wife is from Iran and I love this piece of Persian food! She is away abroad and I wanted to make this on my own and thanks to this page I could make it myself. Thank you a million! 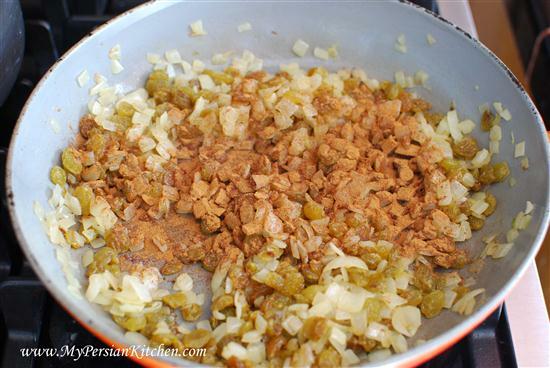 I am looking for the recipee of a stew called Gorma sabz??? i do not know how to spell it correctly. I went to college with an iranian friend who cooked persian food and i loved it! my favorite dish was Gorma sabz, ??? If you can figure out what i’m talking about, please let me know. i also would like to learn how to cook rice and make a “pancake” from the burned rice…Again, do you know what i mean? My hubs is persian and his mom (who is from Iran) makes the most amazing food. He said he was craving this yesterday, so I looked up the recipe in New Food of Life, but wasn’t sure what kind of lentils to use. I searched for the recipe and I am so glad you have shared it! Your recipes are so much more simple! But I still don’t know what kind of lentils to use. Any suggestions? Kelly, I use regular brown lentils. hi,iam from iran,i love this food. Could you advise me on how to adapt this for the crock pot? 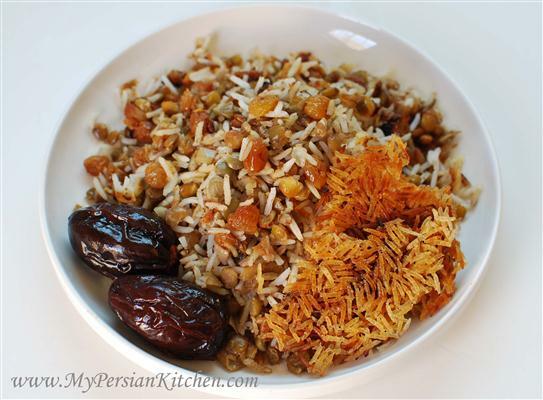 I’m going to a Persian Spring celebration tomorrow evening and I want to take this dish. I’m feeling I could cook everything as suggested and layer in the crock pot. The tricky part is how long to cook in the crock pot? I go to a lot of gatherings where we share food and use the crock pot all the time. I would love your recommendations on using the crock pot for your dishes. Thanks so much! Amrita, I have never made rice in a crockpot. I’d have to experiment a few times before even coming close to giving advice on how to do it. If I use a rice maker, do I parboil the rice? Sandra, if you use a rice make you don’t need to parboil the rice. However, you’d have to mix the rice and the ingredients once the water has absorbed, otherwise everything will stay on top of the rice. Madeleine, yes, you have to cook the meat first then add it to the rice for the steaming stage.